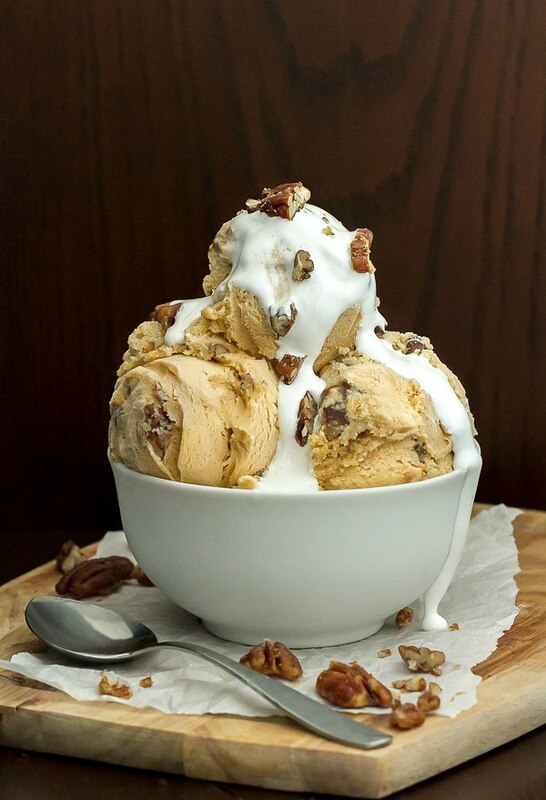 Sweet Potato Pie Ice Cream with Candied Pecans and a drizzle of marshmallow cream. My take on the perfect fall/Thanksgiving recipe. I refuse to give up my ice cream making just because the calendar says it’s fall and suppose to be colder out now. After all, I’m in Florida and it’s always ice cream weather here! It’s funny to me that I don’t particularly care for pumpkin pie much, yet I really like sweet potato pie. Plus, I’ve always been a sucker for those sweet potato casseroles that pop up around Thanksgiving. My sister-in-law, Becky, makes a killer one. My mom and I fondly call it “sweet potato fudge.” Honestly, I don’t think I’ve ever had a sweet potato recipe I didn’t like. I’ll take sweet potatoes any way I can get them. So it only seemed natural for me to make a sweet potato pie ice cream. This ice cream recipe is very similar to my pumpkin spice ice cream. And to make it extra special, I added candied pecans and topped it with a drizzle of marshmallow cream, both my favorite sweet potato casserole toppings! This sweet potato pie ice cream has a few extra flavors that I know you’re going to love. I added a little bit of bourbon, because, well… I couldn’t think of a good reason not to! Also added a little bit of maple syrup and orange zest. It’s really a delightful combination of flavors. Even if you’re not a big sweet potato pie or sweet potato casserole fan, I really think you’ll enjoy this sweet potato pie ice cream. Because after all… it’s ICE CREAM! What’s not to love about that? Even my husband and son who are not big sweet potato fans gave it two thumbs up! So dig in! Be sure to put your ice cream canister in freezer the day before making this recipe! Bake sweet potato in 350° oven until soft. Scoop out insides and puree with maple syrup until smooth. Set aside to cool. Meanwhile, in small saucepan melt the butter, maple syrup, brown sugar, cinnamon and salt. Add pecans and stir to combine well. Pour pecans onto parchment lined baking sheet and spread in single layer. Bake in oven (you can do this while baking the sweet potato) about 8 minutes. Stir halfway through cooking. Remove from heat, let cool. Roughly chop the pecans if you prefer smaller pieces in your ice cream. Separate egg yolks and whites. Add egg yolks to cold saucepan, lightly whisk to blend the yolks. Reserve whites for another use. Add milk, cream, sugars, cinnamon and salt to pan. Whisk to combine. Gently heat mixture and continue to stir with wooden spoon while heating until mixture thickens and coats the back of a wooden spoon. Swipe your finger across the mixture on the back of the spoon and if the edges stay put, it's ready. Takes about 5 minutes or so once the mixture comes to a simmer. If you have a candy thermometer cook until 170-175º Don't rush it and turn your heat too high or you'll scramble the egg yolks a bit. Remove from heat and stir in the sweet potato puree, vanilla and bourbon, orange zest. Strain mixture through wire mesh strainer into bowl and set bowl in ice bath for about 30 minutes to cool down (stir occasionally). Store custard base in refrigerator for several hours or overnight to thoroughly chill. To make the ice cream, pour custard base in ice cream maker and process according to your ice cream maker's instructions. For me, it's about 15-20 minutes. A couple minutes before it's finished, add pecans. If you want to top ice cream with marshmallow cream, combine a large spoonful of marshmallow fluff with a little bit of hot water, about a teaspoon, and whisk until combined and desired consistency. Pour on top of ice cream. Oh my gosh, this couldn’t be anymore perfect for those of us still in warm weather but desperate to celebrate fall! Love the marshmallow creme idea. Your pictures are consistently mouthwatering-ly pretty! I’ve taken a sabbatical due to my day job but recently went part time, so I’m hoping to pick up my camera again soon–this post is inspiring me! Thanks Sarah…as you can probably tell, I haven’t been posting much around here lately but I don’t have a job to blame…just hard to get in the mood for fall food when it’s still hot and humid outside! Look forward to your photos! Would love to try this , it looks spectacular!!! I just pinned them! Sweet Potato ice cream seems yummy and interesting! It’s yummy…tastes like the pie! Sweet potato in ice cream. I’m in! How can I make this dairy-free? ive never made ice cream and wouldnt even know where t start but this is some kind of motivaton my dear! thank you for the fanstastic idea! I am definitely in love! 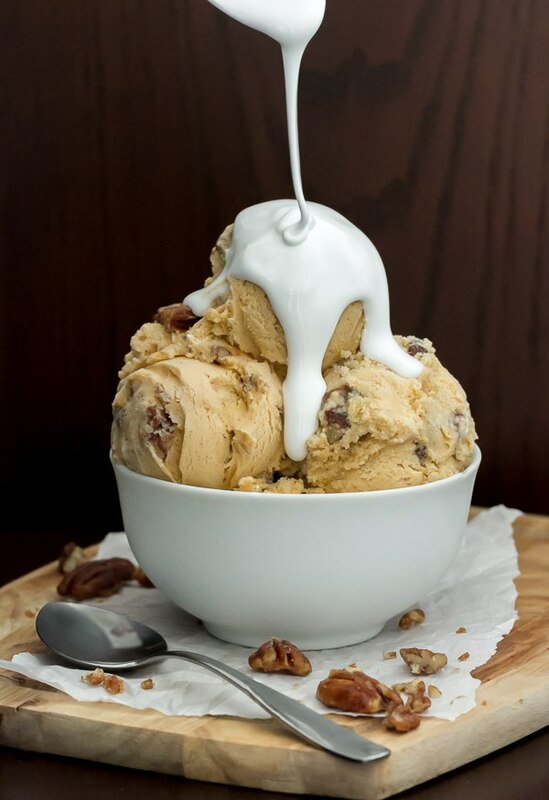 This is my kind of ice cream for sure and you just made it even better with the candied pecans!! You are so lucky it’s still ice cream weather! It’s getting colder where I live, but I still refuse to stop eating ice cream! 😀 Even if I have to cover myself up in 1-2 blankets while I eat it!! Your photography is so excellent the food comes alive and looks so very appetizing! What a delicious fall and thanksgiving treat! Omg this looks amazing! I’ve never made my own ice cream before, but it looks like I’ll have to give it a try now! I am also a big fan of sweet potato casserole and because of that I have a sweet potato pecan bread on the blog. Never thought of converting it into ice cream. I need to try this soon. I am helping 2 13 year old boys make this recipe for a school project. Is the bourbon optional? I haven’t tried it without the bourbon but I can’t imagine why it wouldn’t work. Try replacing it with more good quality vanilla extract. Alcohol does make ice cream a little softer so I don’t know how hard the ice cream will freeze…you might have to let it sit out of the freezer for a bit to scoop it. Good Morning from Hawaii. We made this reicpe last night and I have it in the kitchenaid mixer right now. IT does not seem to be as thin as it maybe should be and is clumped around the attachment blade. Any idea for the next batch? And how much does 1 batch make? Thanks! Hi Faith, I’m sorry to say it’s been quite a while since I made this so I don’t remember if it was thicker than normal or not… perhaps because of the sweet potato. And since sweet potato does have some fiber that could be why it’s clumping around the blade. Try freezing it into ice cream and see what happens. If it freezes too hard, let it sit out on the counter to soften before eating.